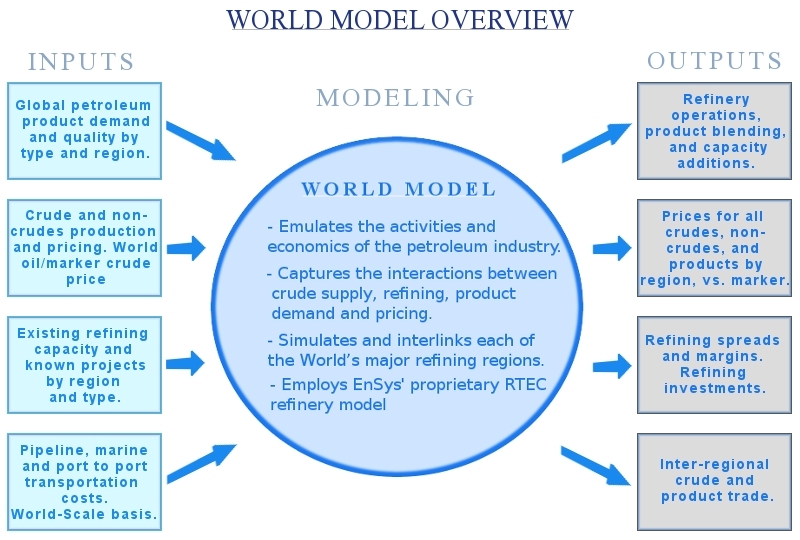 EnSys’ World Oil Refining Logistics and Demand (WORLD) Model® captures the global, interlinked nature of the “downstream” petroleum industry, providing projections for global refining activity, investments, margins, and utilizations, crude and product flows, and pricing/differentials across alternative scenarios. WORLD extends analytical boundaries because it brings the key parameters of the downstream into one system. As a result, industry stakeholders from government agencies, to industry institutions to producers, refiners, mid-stream, marine and technology organizations work with EnSys or license WORLD to examine and foresee the impacts of new developments from reference supply/demand outlooks to regulatory initiatives, to new logistics to process technologies. WORLD works by marrying together top-down oil price demand and supply data and outlooks (from EIA, IEA, OPEC or other sources) with EnSys’ own bottom up detail on refining, products, and transportation. Given a “top down” outlook, the model provides projections of global refining developments, (throughputs, expansions, investments, utilizations, closures and margins), crude and product flows and crude and products regional pricing/differentials (relative to an input marker crude price). Refining CO2 emissions are also computed as are other parameters such as catalyst requirements and product blending and quality detail. The WORLD Model is highly flexible, with the ability to model short, medium, and long-term forecasts. The model can also be adjusted for focused analysis on a specific aspect of the supply system such as land or marine fuels quality regulations, condensates or FCC modes, regional crude logistics and trade, the impacts of a carbon regime initiative or new process technology developments. 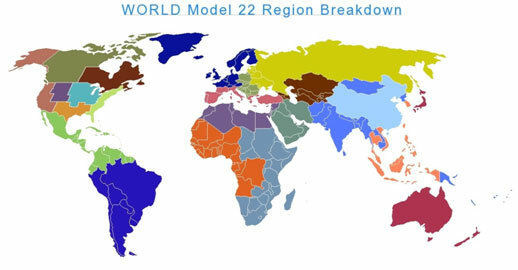 The current version of the WORLD Model® divides the world into 23 regions with the greatest level of detail dedicated to the USA and Canada thus delivering the capability to project the market impacts of on-going regional supply and logistics developments. This detail can however be “shifted” depending on client interest in order to create a WORLD variant with focus on one or more other world regions. At the core of the WORLD Model® is EnSys’ RTEC Refinery Technology module used to accurately simulate some 200 crude oils, multiple processes, product blends and specifications. Contact us today at info@ensysenergy.com or 781-274-8454 to discuss how WORLD modeling can support your organization. The WORLD Model forms the basis of many EnSys Energy consulting assignments. Our goal is to deliver meaningful, quantitative insight into key strategic questions affecting the industry at the national, international and global level. For examples of recent studies click here.